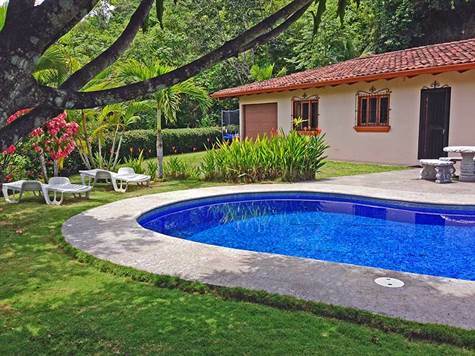 If you’re looking for a well-maintained fully equipped home with spectacular views, surrounded by Costa Rican nature, then this is the property you should visit! This villa is located on top of a hill with incredible privacy, but still living in a community with great neighbors. When you’re standing on the property, you are overlooking the Opera Salvaje residential community in the Playa Hermosa area. You have ocean view, experience the jungle sounds, hear the nearby river and waterfall. The colorful tropical macaws fly their daily routes right here and will land on your trees. That’s why the name “Villa Vista Macaws”. This property has gone through some recent renovations. The roof for example has been made with beautiful tiles and has high wooden ceilings inside. The kitchen is very modern with a gorgeous granite L-shaped top and is fully equipped. The property comes with 1.2 acres / 5080 sq. mts of land and has it’s own hill with a hiking trail at the back. This villa is one of the best values on the market. This makes a secure investment with the future International airport just 45 minutes away. Esta villa se encuentra en la cima de una colina con una privacidad increíble, pero aun así, se encuentra en una comunidad con grandes vecinos. Cuando usted está de pie en la propiedad, puede ver la comunidad residencial Opera Salvaje en la zona de Playa Hermosa. Cuenta con vista al mar, la experiencia de los sonidos de la selva, el sonido del río cercano, y cascada. Verá a los coloridos guacamayos tropicales que vuelan sus rutas diarias por este lugar, y aterrizarán en sus árboles. Es por eso que el nombre de la propiedad es "Villa Vista Macaws". Esta propiedad ha pasado por algunas renovaciones recientes. El techo, por ejemplo, se ha hecho con hermosos azulejos y tiene techos altos de madera en el interior. La cocina es muy moderna, con un sobre de granito superior en forma de L, y está totalmente equipada.